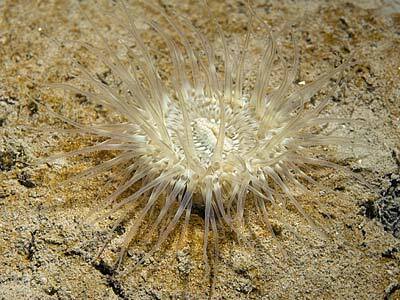 Description: This sea anemone has a wide and firmly adherent base. The column is tall in extension, tentacles long and graceful, arranged in multiples of six. Acontia are not readily emitted. The column is pale yellowish buff, with paler stripes at the lower end and darker stripes of brown or reddish speckles along its whole length; small dark spots are present on the upper half - these are not suckers. The disc and tentacles are translucent pale greyish, disc variegated with cream and with a regular, but not striking pattern. 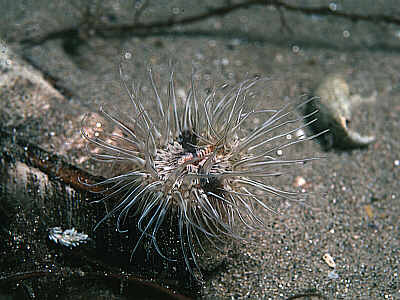 The tentacles have lateral dark lines down their length. Size up to 60mm across base, height to 120mm. Habitat: Typically buried in mud or sand, attached to a stone or shell below the surface; sometimes amongst rocks, in caves, etc. where specimens tend to be smaller and darker in colour. On shore or sublittoral down to 100m or more. Distribution: All coasts of Britain and western Europe to the Mediterranean. Quite common but usually mis-identified as Sagartia spp. from which it is very distinct. Similar Species: In contraction this species can become very flat, only a few millimetres thick. Some specimens have wedge-shaped segments of the disc coloured dark brown or black, often extending onto tentacles. A very elegant anemone when fully expanded. Distinguished from Sagartia spp. and Cereus pedunculatus by lack of suckers and different coloration. Compare with Sagartiogeton laceratus. Acontia present but suckers absent, never with gravel stuck to column. Striped pattern on column is consistent and distinctive. Tentacles very long and diaphanous in full extension (usually only in darkness). Picton, B.E. & Morrow, C.C. (2016). Sagartiogeton undatus (O F Müller, 1788). [In] Encyclopedia of Marine Life of Britain and Ireland.